Ammophila arenaria leaf. 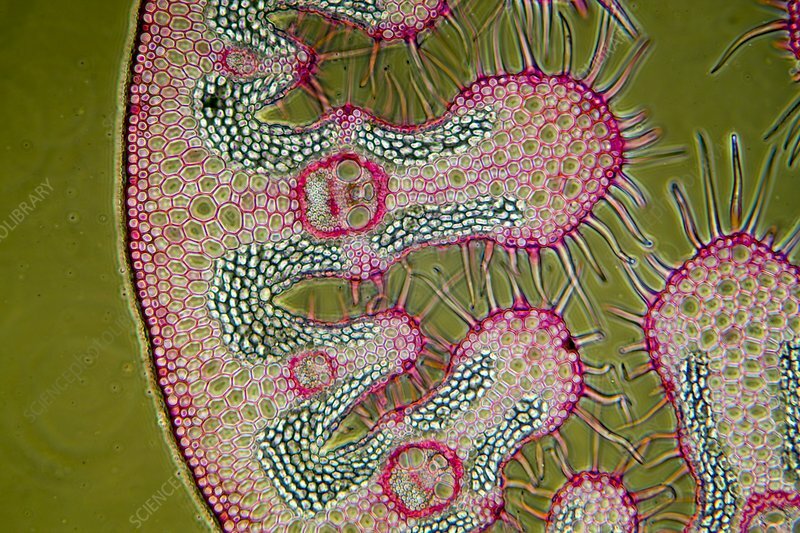 Light micrograph of a section through a marram grass (Ammophila arenaria) leaf, showing the characteristics that help reduce water loss. The outer epidermis (outer circle) consists of a layer of thick cuticle and layers of thick walled sclerenchyma (red), while the inner epidermis is folded and hairy (pink) to trap water vapour. Chloroplasts (green and pink), phloem (green and pink) and xylem vessels (red) can also be seen. Magnification: x37 when printed 10 centimetres wide.